In a figure-flaunting gown with sheer accents and intricate beading, Amanda married her beau, Gerardo, in front of family and friends. 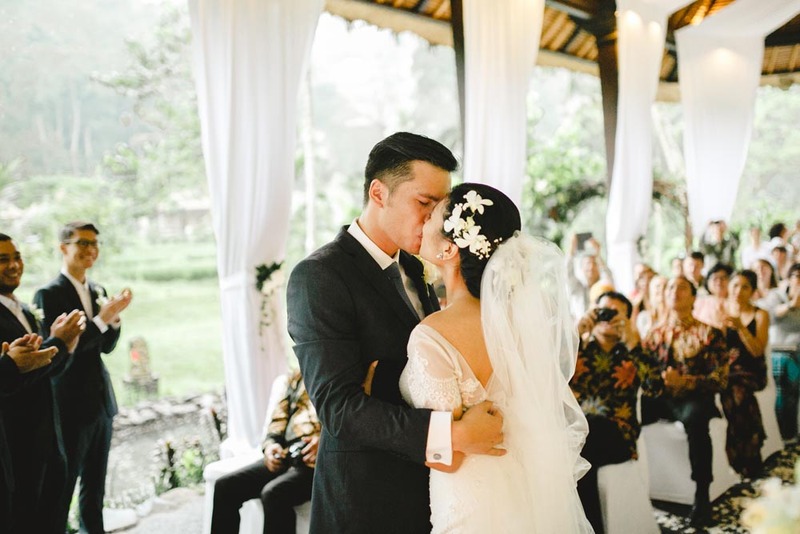 Equally as beautiful as Amanda's wedding dress however, was the location itself — Bali. 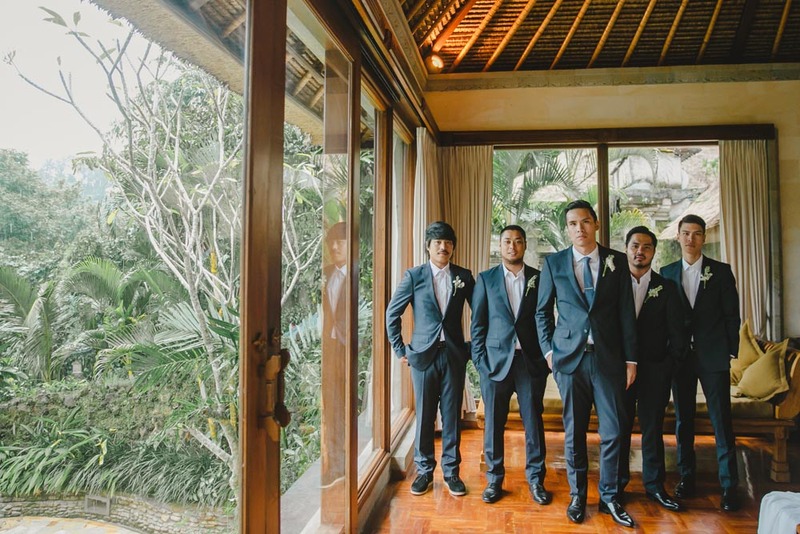 The couple's ceremony and reception was held in a traditional temple which made for the most romantic of settings. To put it in other words, if you've been contemplating a destination wedding, this should be all the convincing you need. The best thing about having a destination wedding is that it allowed us to spend quality time (even after the wedding) with our closest family and friends. 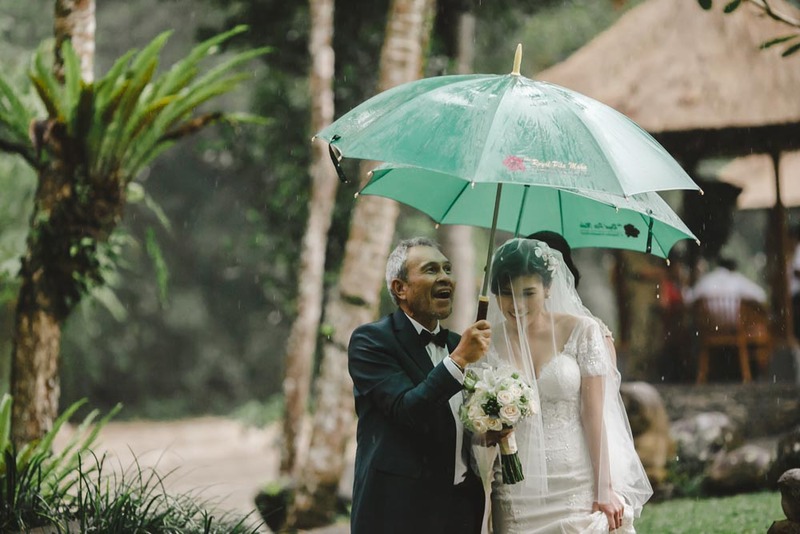 Why did you choose a Bali wedding and what was the best thing about having a destination wedding? To be honest, it just seemed like the natural choice and everything fell into place to make it happen. We both have family across 3 continents! 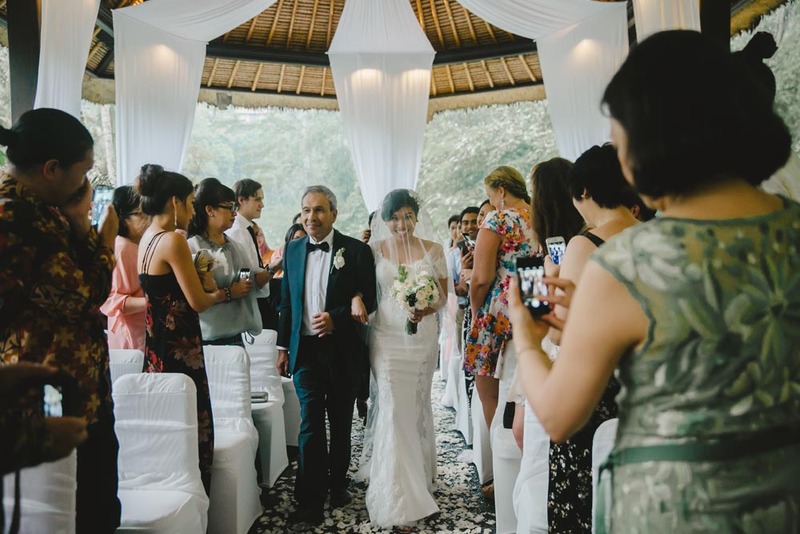 Because the wedding was in Bali, we were able to invite guests such my Grandmother and Gerardo's two Aunts who would not have been able to attend if we had hosted the wedding in Australia. 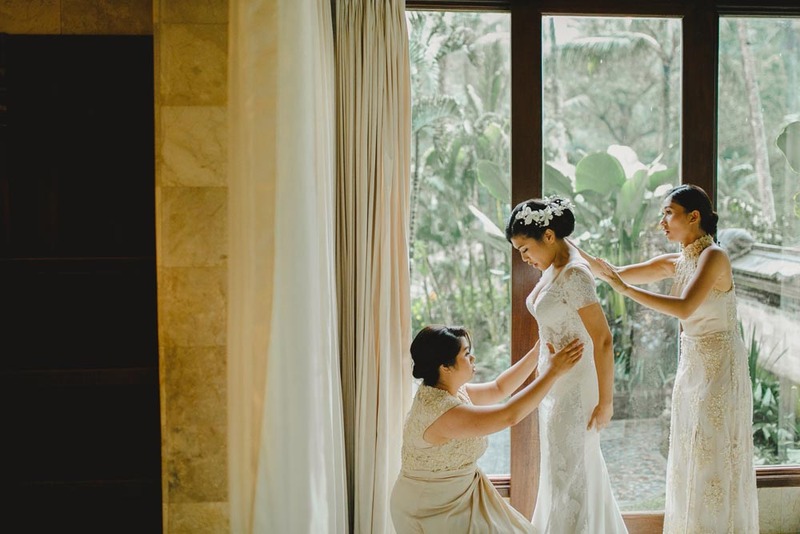 The best thing about having a destination wedding is that it allowed us to spend quality time (even after the wedding) with our closest family and friends. Had you visited Bali before? Yes. We've visited Bali several times. We also went to look at other potential venues months prior to the wedding as we were undecided at the time, eventually deciding on Botanica Weddings almost immediately after seeing it online. How long did you stay in Bali and did you do any pre or post activities whilst here? We stayed in Bali for two weeks in total. A week prior to the wedding, we went to Mount Batur for our pre-wedding photos. Most of this time was spent with family and friends. We also visited the Gili (Meno) Island for our "mini-moon". 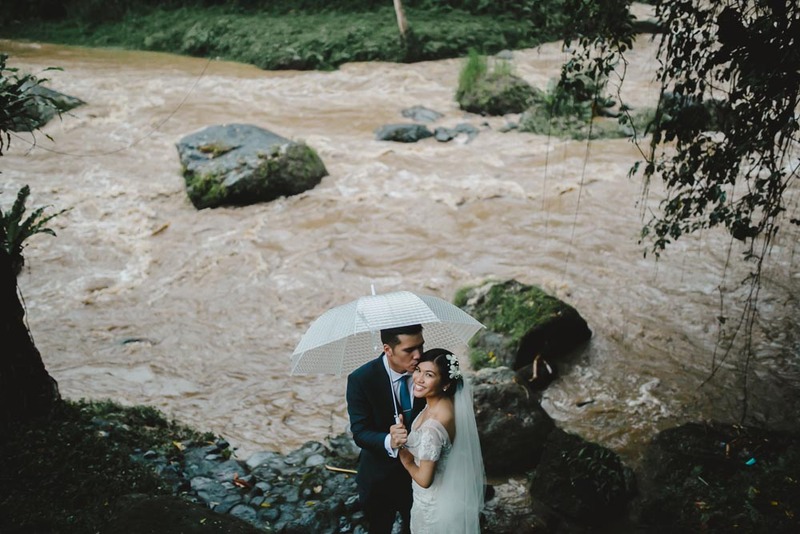 The rain was one of our most favourite moments of the day. This was initially my worst fear as the reception was meant to be held outdoors. But the rain actually complimented the venues tranquil/natural surroundings. It was magical. Did your wedding have a theme or a particular style? Please give details if possible about your dress, bridesmaids dresses and any other styling on the day. We didn't really have a particular style. 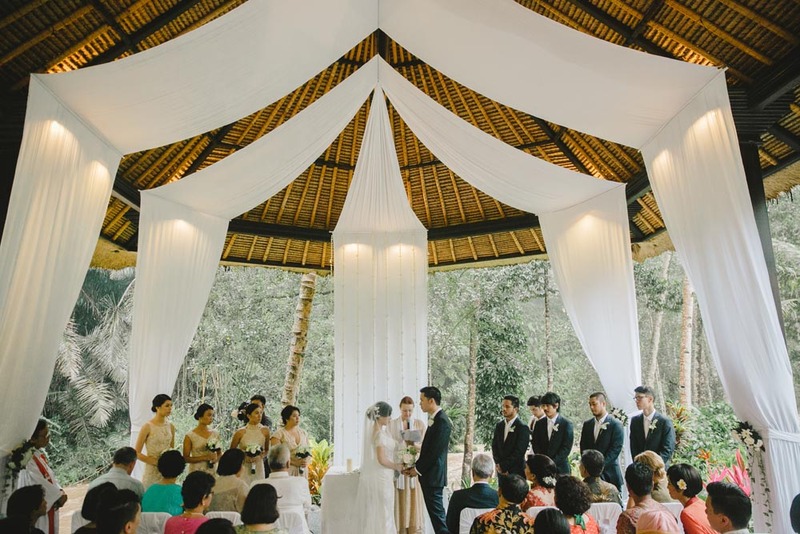 We had our ceremony in an outdoor pavilion by the Ayung river and we were surrounded by lush tropical trees and plants. The setting was breathtaking, it was very earthy and natural - which is what we were after. We chose a simple mix of white flowers and greenery to decorate, as we didn't want anything to steal the attention away from the beautiful natural surroundings. I had originally designed my own wedding dress. However, unfortunately the dress didn't turn out the way I had imagined. Three months prior to the wedding I found my second dress - by Maggie Soterro and it was just perfect! It was simple, unique and svelte. I helped design the girls dresses. I wanted the girls to be in something that reflects their style and personality. However, I always knew that I wanted their outfits to be made out of french lace and full of embelishments. The setting was breathtaking, it was very earthy and natural - which is what we were after. We chose a simple mix of white flowers and greenery to decorate, as we didn't want anything to steal the attention away from the beautiful natural surroundings. What is your favourite memory of the day? My cousin singing "Stella by Starlight" for our first dance and my uncle accompanying her on the piano. The rain. This was initially my worst fear as the reception was meant to be held outdoors. But the rain actually complimented the venues tranquil/natural surroundings. It was magical.